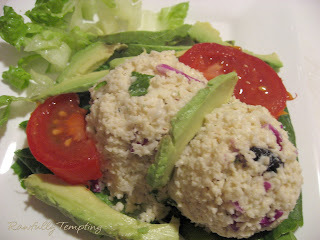 I've been posting some real "Quick and Easy" recipes the past few days. W is still away, and when I prepare food for myself, I want it to be seriously simple. Chef Russell James is at it again and posted a few awesome videos. 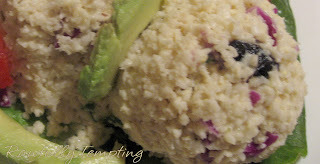 One of them contained this cauliflower recipe, and like me, he is encouraging you to PLAY in the kitchen and let yourself be creative. Take a basic recipe and run with it. This is what I did after watching his videos. 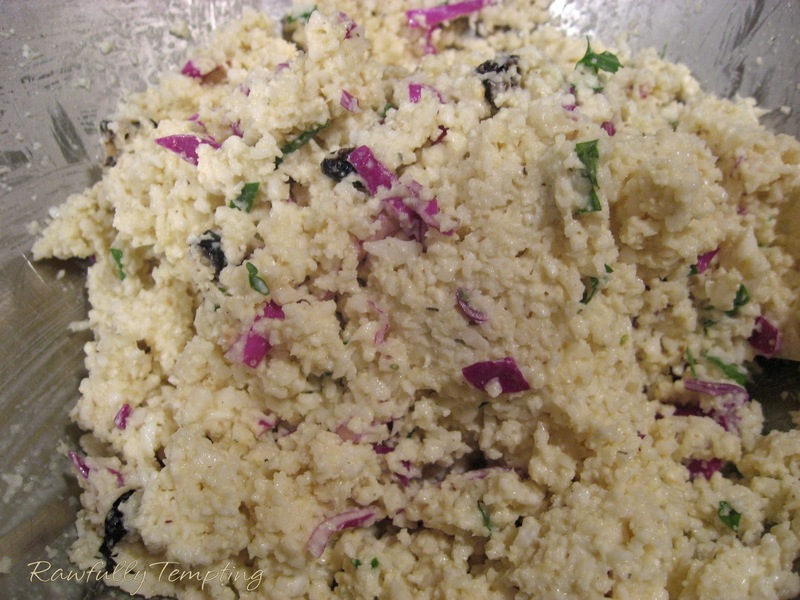 In a food processor, pulse the cauliflower until it is "rice-like." In a blender, blend cashews, pine nuts and water. 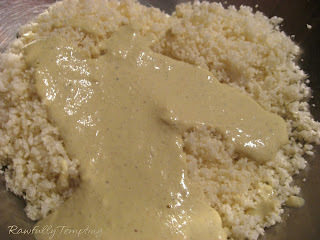 Add salt, lemon juice, nutritional yeast, Italian herbs and blend until creamy. Put cauliflower rice into a large mixing bowl and pour sauce over rice. Add fresh chopped parsley and/or basil, sliced olives and a bit of chopped red cabbage for color. (you can use tomatoes as Russell suggests). Mix well and add garlic powder, cracked pepper. Taste for flavor and add additional salt or seasoning as needed. You could add shredded carrots for color as well. Serve over a bed of lettuce and garnish with avocado, tomatoes and other vegetables. If you have any dehydrated crackers, they would go great with this as well. Let this sit for about 30 minutes. I think it tastes better!